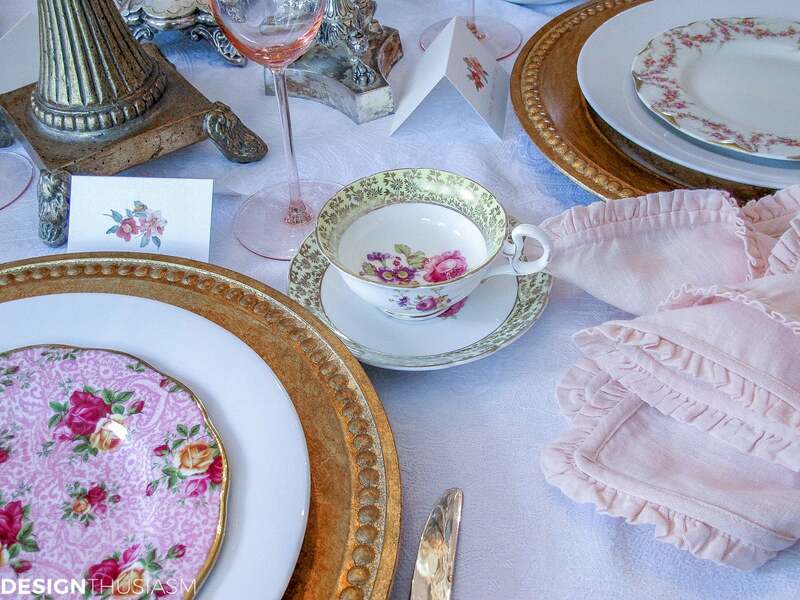 In this post: If you’re looking for Mother’s Day decoration ideas, this brunch table setting mixes vintage china patterns with jewels for feminine style. I don’t wear a whole lot of jewelry and I almost never wear pink. But my tables, on the other hand? They love to wear both! 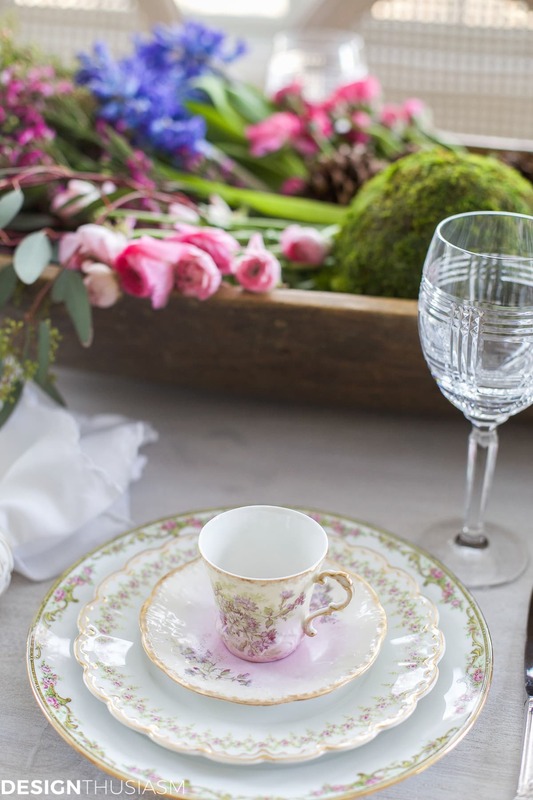 When it comes to Mother’s Day decoration ideas, I love to pull out all the stops celebrating feminine charm and nothing communicates that feeling as easily as mixed vintage china and pretty baubles. For this Mother’s Day tablescape, I chose to highlight the key ingredients of traditional femininity, updated with a light touch and a whimsical use of jewels pulled straight from the dressing table. 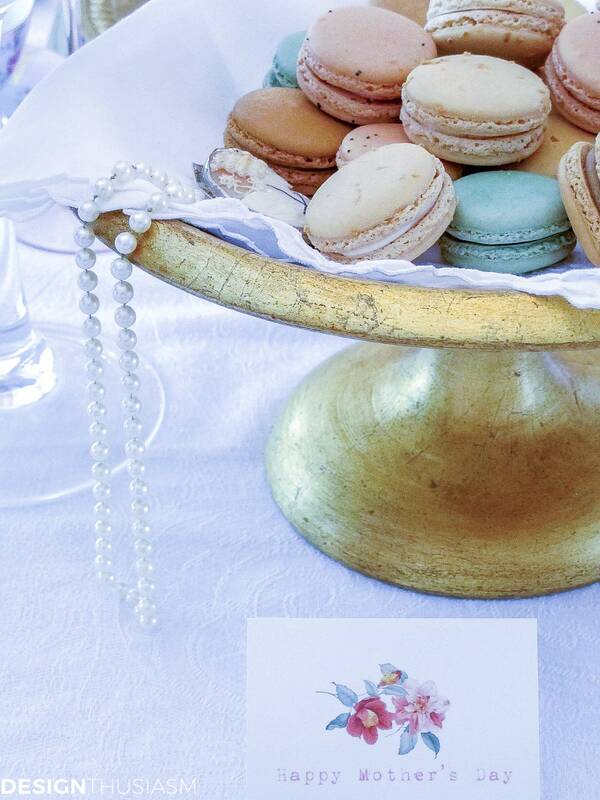 The draped pearls and other vintage jewelry pay subtle homage to the moms and the French macarons added both color and sweetness. The floral table cards are my own design. 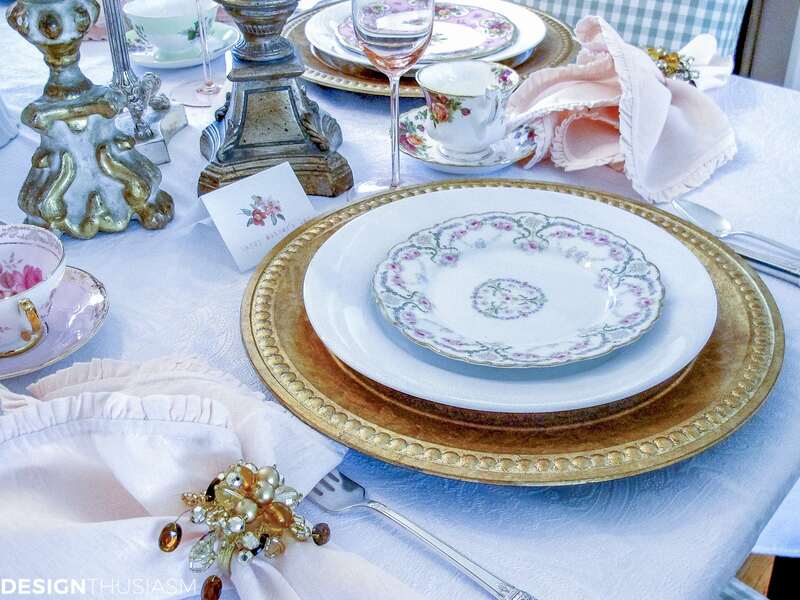 The foundation of the plate stacks begin with beaded gilt chargers and simple white dinner plates, each topped with a different vintage salad plate. 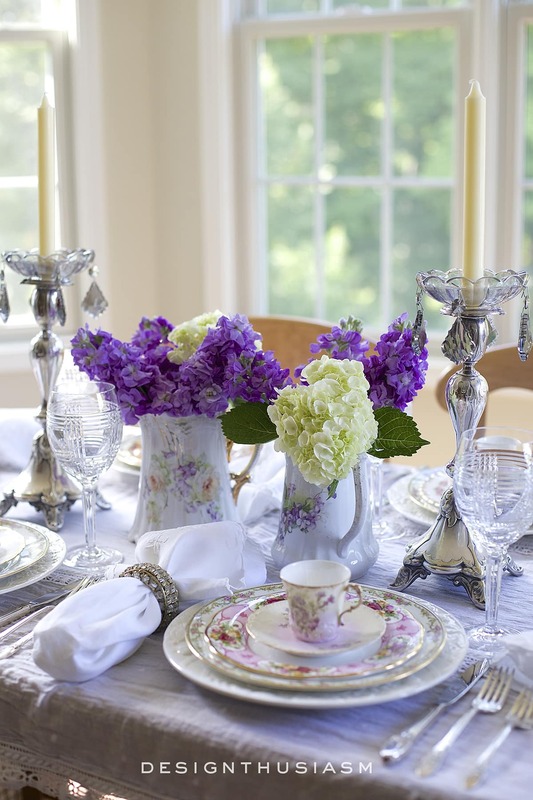 The soft color palette and refined floral imagery is what unifies the look. 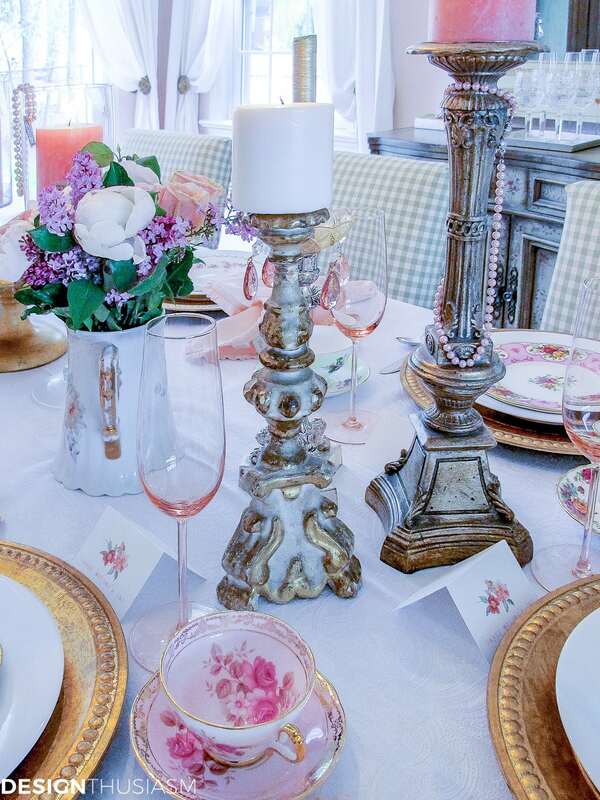 The use of multi-tiered candlesticks in varied materials added height and grounding to the tableau. The candlestick holder in the center is one of the oldest pieces in my collection, a seventeenth century church candle holder purchased on a recent trip to Florence. 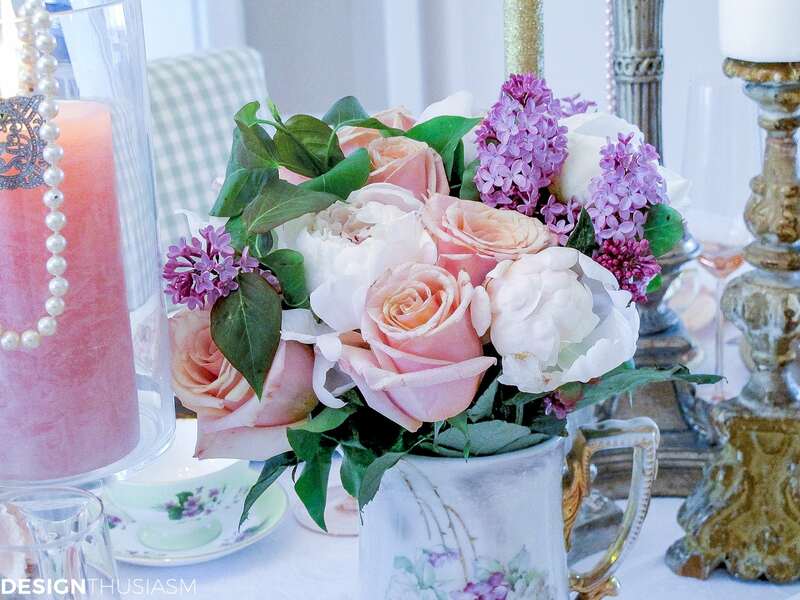 No table is complete without a fresh bouquet. 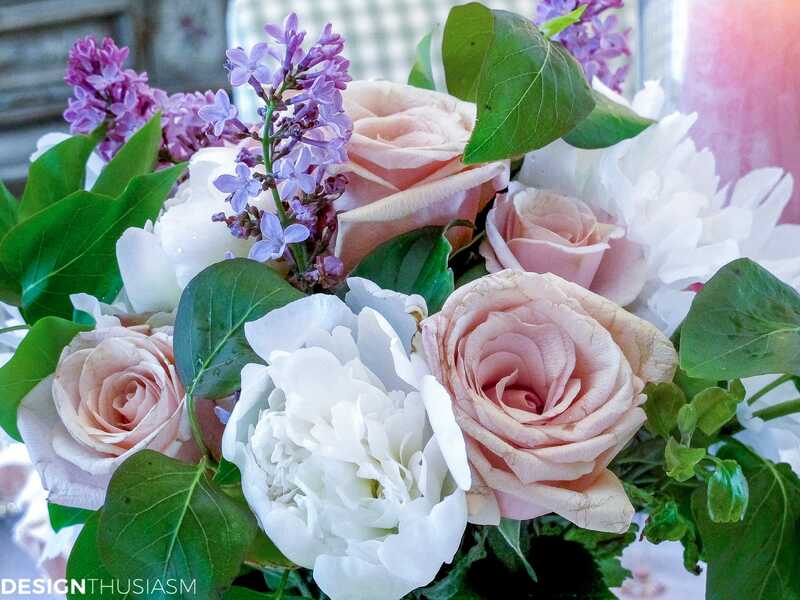 Here lilacs, peonies and roses provide both visual and aromatic delight. Pale pink champagne flutes offer more rosy color, along with other pops of blush pink seen in the draped pearls and crystal drop bobeches. One of the many teacups in the mismatched setting. 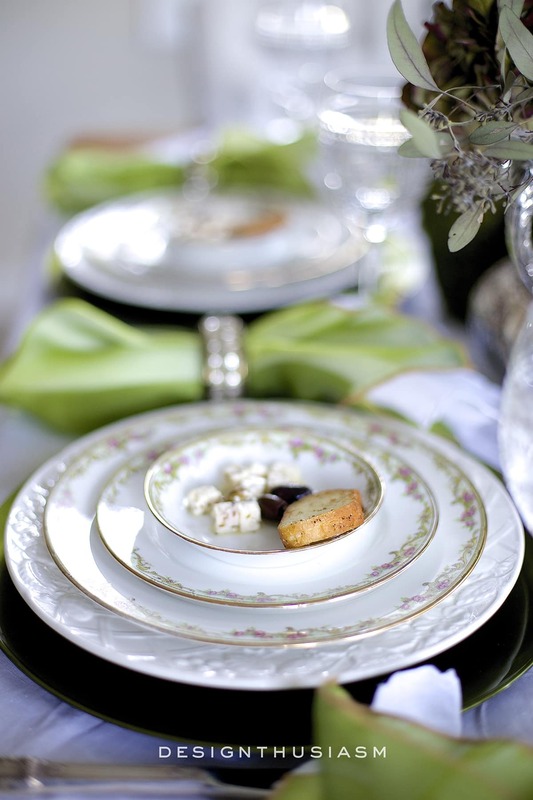 The vintage flatware is called ‘First Love’, a perfect match for this romantic setting. Tips and tricks: I often re-use simple white dinner plates to offset the patterns and keep costs reasonable. This classic damask tablecloth has made many appearances, as well. 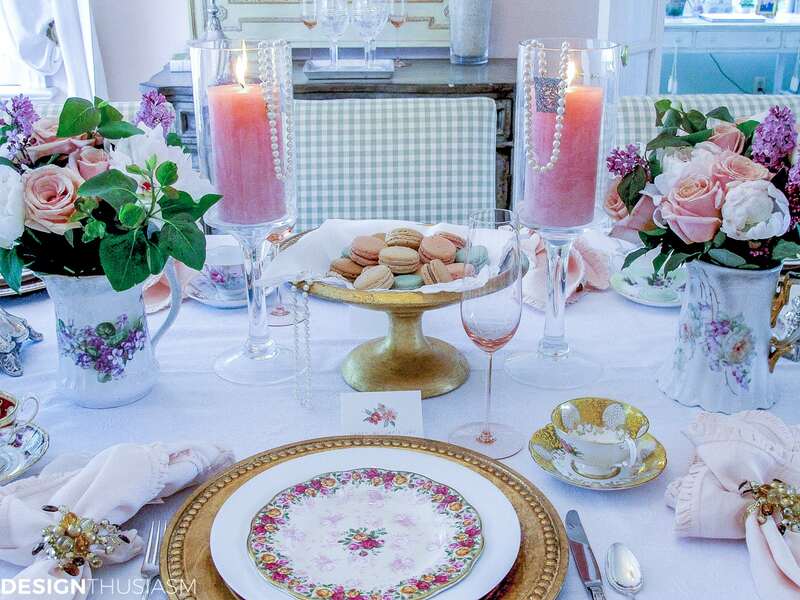 Decorating with food, such as the macarons in the centerpiece, is an inexpensive way to add color and hint at your theme, and I often use menus and table cards as a venue to mirror the visual theme. You set a lovely table. 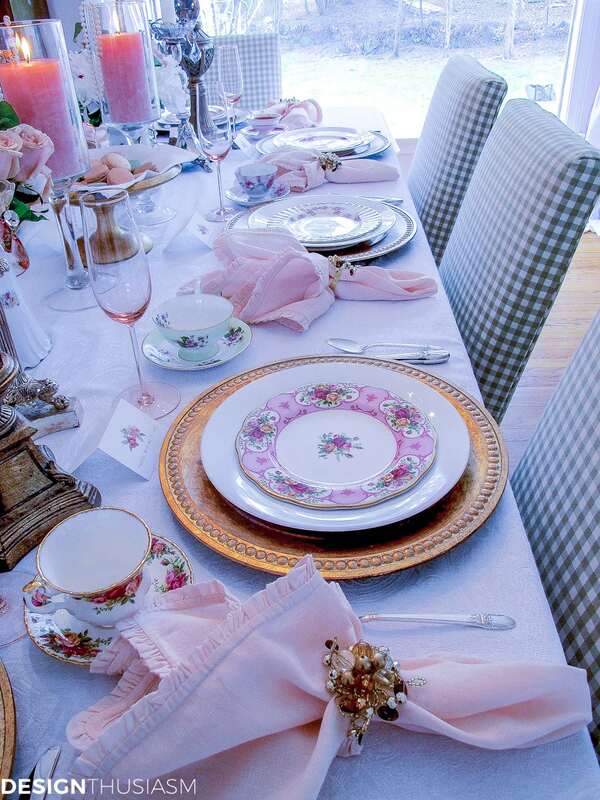 I love pink and lovely old mismatched china. 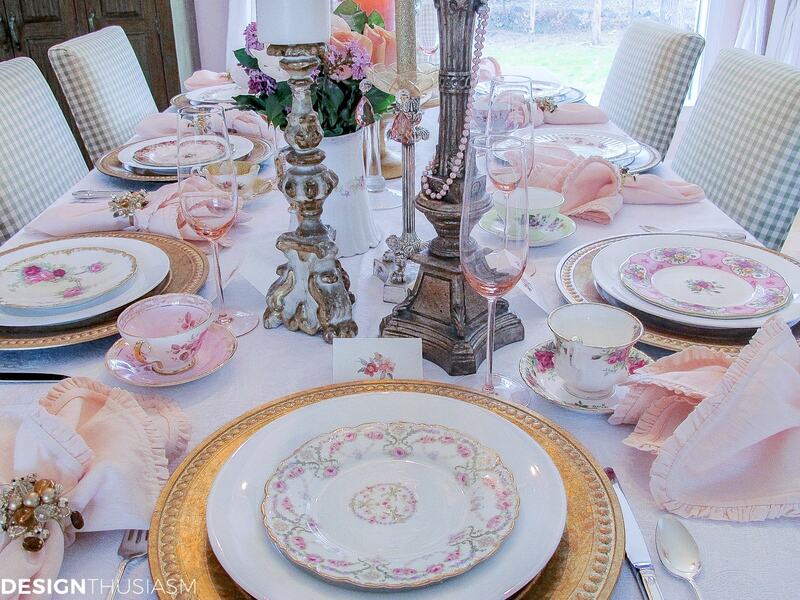 You did a marvelous job of melding the patterns together into a charming cohesive tablescape. Just Lovely!!! Oh wow, so beautiful. 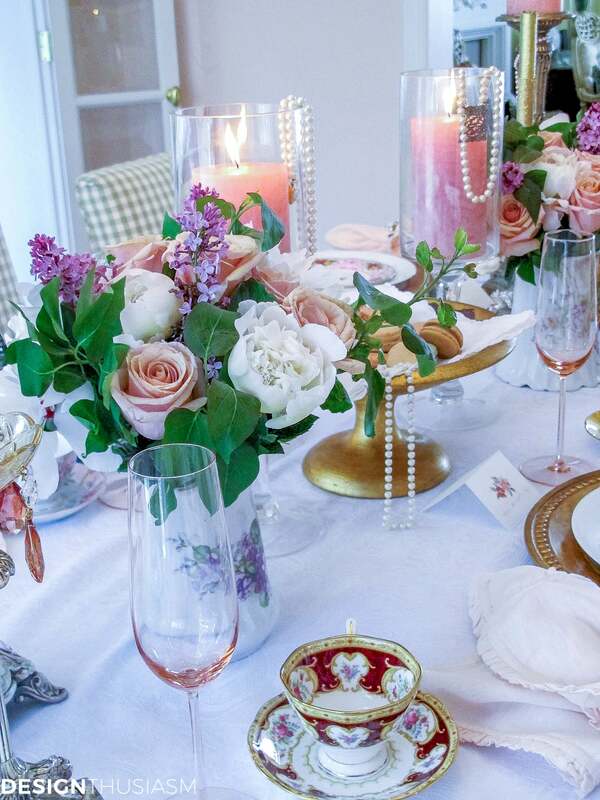 I love the accent of pearls, this is such an elegant table and the pearls are such a great romantic touch. Love the soft, delicate colors. The pearls and cameo are such great personal touches. Beautiful! I love your beautiful romantic table! So very pretty! Love the soft colors. All your tablescapes are stunning, you have much talent and it is great that you have started a blog to express it and share with others. What a nice thing to say! Thank you. That means a lot to me, given that I’ve seen your talent and value your opinion. your tables are certainly beautiful. 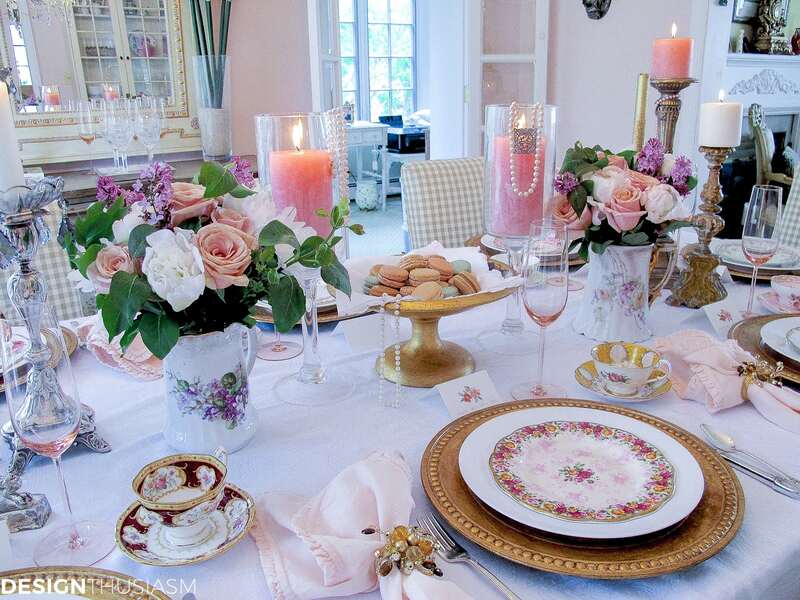 I especially like the Mother’s Day tablescape. Pink is a favorite color and also pearls. I entertain quite a bit, and prize myself on my tablescapes. 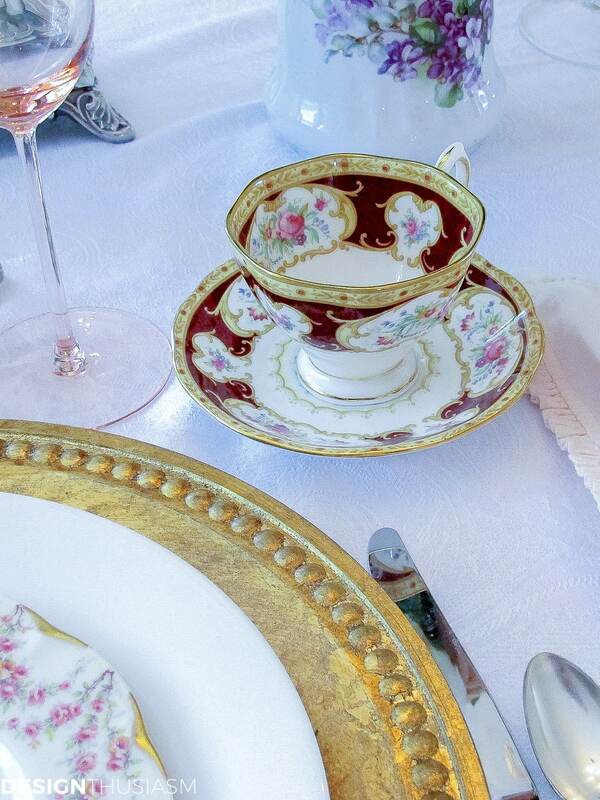 I will chose some of your ideas, but will use vintage Moss Rose china. I’m from the old school where the china all matches. Thank you for sharing your gift with us! Beautiful and elegant. Love it!